Whenever I see a red checkered tablecloth, I can’t help but think of a picnic. Turned into a colorful blanket, the symbol of eating al fresco is the classic canvas for a spread of old-fashioned American culinary delights. Add a green hillside dotted with daisies and a woven wicker basket. Now toss in a bottle of wine accompanied by plates of cheese, bread, and fruit. For good measure, bring along a few large brimmed hats, and the picture is complete. With summer now in full swing, the desire to picnic is picking up. This portable and often impromptu outdoor meal is a wonderful option with the increased selection of fresh, seasonal local produce at farm stands and regional cooperatives. Browsing the produce and prepared food sections of your grocery store or the stalls of local farmers markets inspires a seasonal picnic menu. 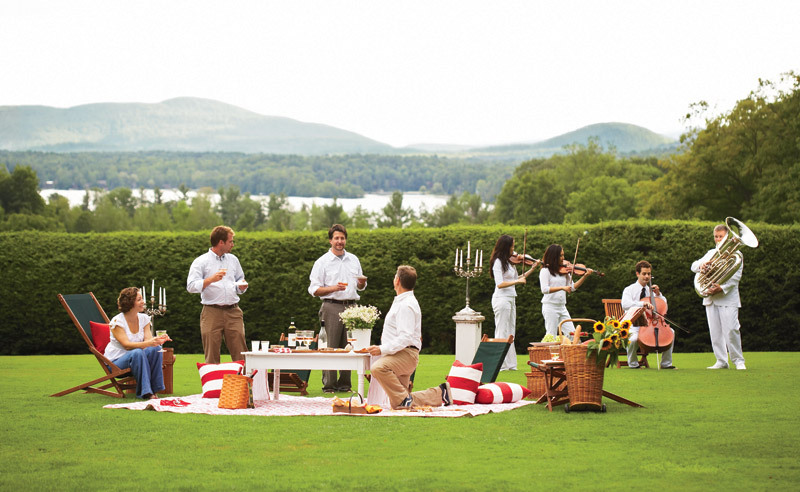 The ideal picnic has a certain romantic elegance. 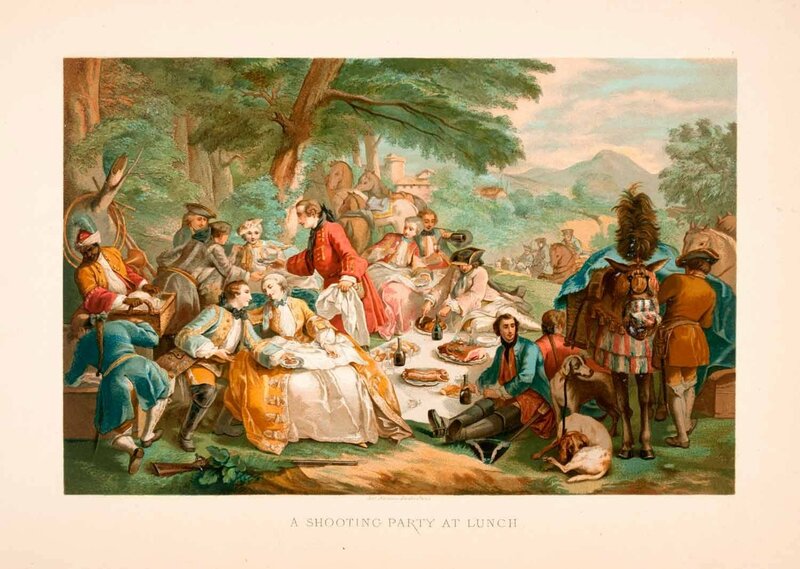 Victorian style picnics came into fashion in America by the 1860’s and were often very elaborate affairs. Designed around lengthy menus and elegantly outfitted hampers, Victorian picnickers filled them with every tool and gastronomic delight imaginable: Dishes included timbales, stuffed eggs, pressed chicken salad, aspics, jellied roasts, fish balls, and the ever-popular baked bean sandwich. Desserts featured puddings, prune and other fruit whips, custards, and cakes. 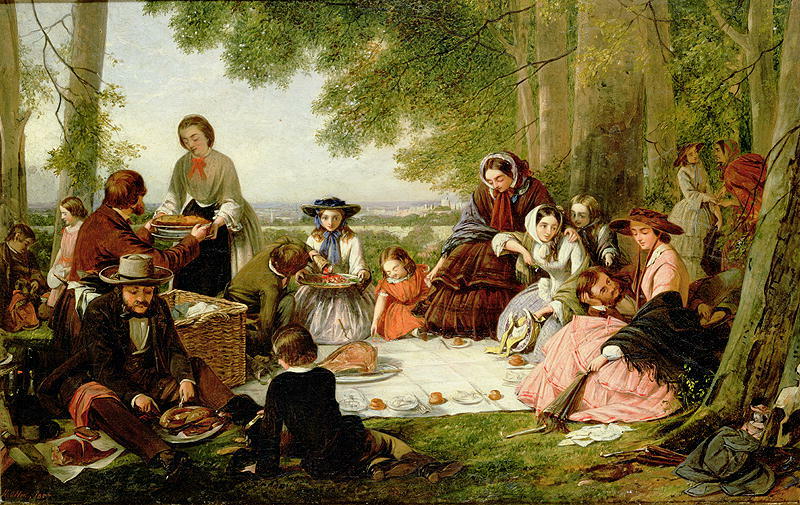 By the 19th century, the American picnic was a sort of English high tea en plein air. This stylish “informality” in dining came to America via Great Britain, by way of the French. The origins of the word piquenique, according to Michael Quinon at World Wide Words, describe an outdoor gathering with food, where participants bring a little something to the party. The French piquer enjoyed this leisurely pot-luck meal where attendees gracefully picked at delicious trifles of this and that. Historians find references to the word in the17th and 18th century (the period of Louis XIV – XV), and by 1800 it appears in English. I like to imagine the French nobility at these affairs joyously poo-pooing the cumbersome rules of formal dining at Versailles while eating finger food and romping about in nature days before the French Revolution. It is this mildly rebellious spirit of the picnic that makes it such a great match for Americans. 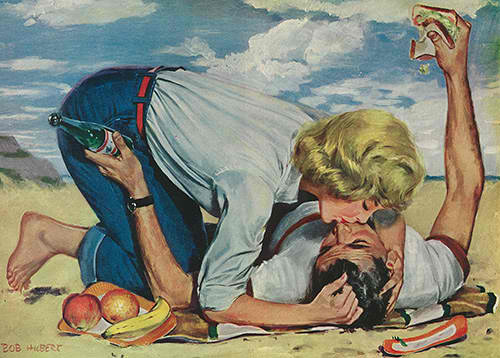 Picnics are a collaborative, resourceful approach to enjoying the fruits of one’s labor in the wild. Busy as bees and as industrious as the ants that march across their picnic blankets, Americans found ways to eat outdoors: clambakes, the old box social, Texas BBQs, and Louisiana shrimp boils. There’s backyard grilling, tailgating at athletic events, outdoor concerts, the Old-Fashioned July 4th family reunion. Don’t forget the hiking trails, seaside vistas, mountain tops, and national or state parks where picnic tables beckon. Given the cornucopia of fresh food from the American landscape, the options for what to pack in the picnic box are limitless. There are no hard and fast rules when it comes to American picnic foods– there are just traditions. Many of us fall back on the reliable cold chicken with potato salad, cole slaw, and rolls, or ham and cheese sandwiches with chips and pickles followed by brownies or fresh fruit salad. Hamburgers, hotdogs, and beans are also perennial favorites for noshing out of doors, and for many folks, cookouts simply feel incomplete without them. On the other hand, there is that extreme form of outdoor dining typical of the professional and competitive picnicker: NFL tailgaters or sophisticated diners on the lawn at Tanglewood light torches and enjoy champagne, entire roast pig, coq au vin, escargots, and chocolate mousse served on real china, eaten with sterling silver and accompanied by linens that are actually made of linen (no folksy red-checkered tablecloths here). Indeed, today’s picnic venues and menus are getting an extreme makeover, but there is no need to go to such lengths to amp up your picnic experience. What we eat at a picnic can be more than a box lunch but need not be a gourmet tour de force. A picnic can be a break from mealtime routine, a chance to commune with both nature and your company. Most importantly, a picnic can be an opportunity for tasting a number of small portable plates that, once consumed in the fresh air, become memorable culinary experiences and part of your own picnic food traditions. High on my list of excellent picnic foods are cold soups and tortes, pickled foods, slaws, local cheeses, and crusty breads. Chilled roasted vegetables and salads travel well and offer that refreshing crunch as well as hydration in the hot weather. Grain-based salads (quinoa, couscous, farro, and barley) are nice replacements for traditional pasta-based and mayonnaise dressed salads. Sliced baked ham, or marinated chicken and beef make wonderful contents for wraps or are great rolled around asparagus and red peppers. Food eaten with your fingers adds to the convenience of the fun we associate with summer picnics. And you can leave the clean up to the ants. Regardless of the equipment used to package, transport, or eat picnic fare, you can plan a quality dining experience that is both smart and simple. Pick up a used basket at a thrift store, or drag out that old Scotch Plaid cooler if you want to be stylish or retro. With the advent of lightweight insulated bag coolers, you can easily hike to your picnic destination and not worry about bringing along ice cold dishes on a summer’s day. If you are looking for a more intimate and personal picnic experience, and the sound of distant thunder looms, plan an indoor picnic. Move over breakfast in bed! Why not picnic on the porch, or on the floor? Bring out the basket, the ground cloth, the picnic plates and cutlery and treat yourself to a great picnic menu under your own roof. Add a few flowers as a centerpiece, and enjoy your own picnic paradise at home. Sometimes the best picnics are those that are not extensively planned. Beautiful weather beckons, friends are free, and with a destination selected, the meal comes together in a collaborative fashion. 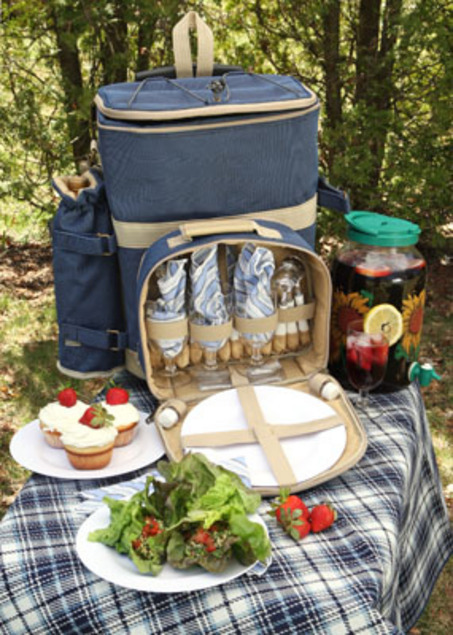 Great expense of time or money is not needed for a sophisticated and satisfying picnic adventure. However, with a little planning and a few good picnic-worthy recipes by your side, you can assemble a simple smorgasbord of samplings that are in tune with the available produce of the summer season. When I got married, a very popular wedding gift was a woven wicker picnic basket. Somehow, that basket with its nestled cups and plates and its snaps and straps for cutlery, a bottle opener, and linens represented the idyllic adventures my husband and I were going enjoy together for the rest of our lives. As someone once said, “You can plan a pretty picnic, but you can never predict the weather.” Now that we are both retired, I’ve dusted it off. For us, eating on the road these days is actually more of a fast food picnic, but I still believe that the stylish wicker suitcase is nothing short of romance in a box. These refreshing cold soups are two of my favorites, and they are just as delicious when served from a paper cup as from a wine glass. The roasted vegetable torte is an Ina Garten gem. I was served this elegant but simply prepared layered vegetable dish at a recent luncheon. It can be served either cold or hot and holds up well. Top it with a spoonful of your favorite yogurt or tangy vinaigrette. Combine the following ingredients in a bowl; toss. Then pureé in a blender till smooth. Serve with chopped cucumber, sliced avocado, croutons, or a dollop of sour cream. Cook onion, garlic, squash, and potato, stirring often, until vegetables begin to soften (but not brown), about 5 minutes. Add curry powder and combine. Add 3 cups stock and bring to a boil. Reduce heat; simmer, stirring occasionally until potato is tender when pierced with the tip of a paring knife, 20 to 25 minutes. Pour through a fine sieve into a clean large saucepan. Set pan over med.-low hat. Stir in remaining 1/2 cup stock; stirring constantly for 5 minutes. Slowly pour in buttermilk. In large sauté pan, cook zucchini, onion, garlic, and 2 tablespoons olive for 10 minutes. Season with salt and pepper. Begin with half of the eggplant, then layer half of the zucchini and onions, then all of the red peppers,then the rest of the zucchini and onions, and then finally the rest of the eggplant. 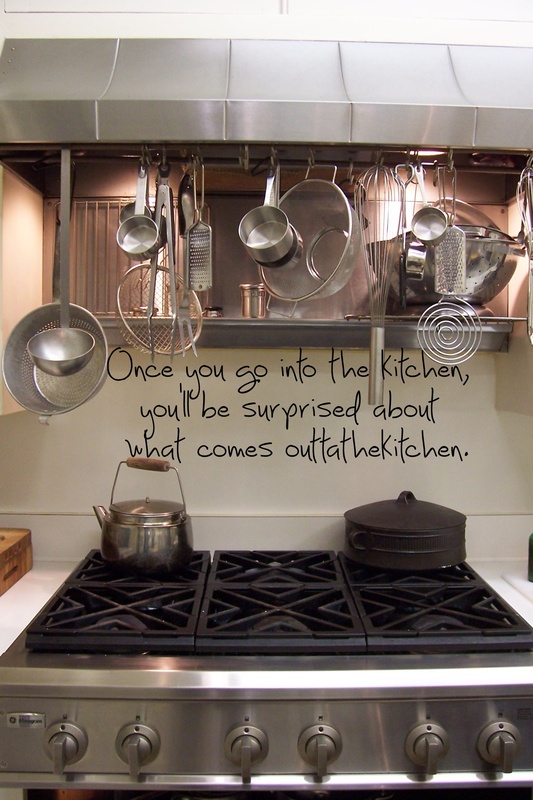 Cover the top of the vegetables with a 6 inch round of parchment or waxed paper. Place another cake pan or bottom of a tart pan on top and weight it with a heavy jar. Place on a plate or baking sheet (it will leak) and chill completely. Drain the liquids, place on a platter, and serve at room temperature. Nothing better than a great picnic. So many things to eat.. Bread, cheese, wine!!! Many other things. What are some of your favorite go-to picnic dishes, Sandy? I’d love to know! Everything, no matter how meager, tastes better at a picnic. Go figure! More guests this week, so more summer fun (and less writing). 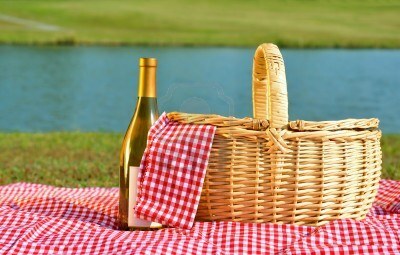 Enjoy this tasty article about picnics!